I doubled several dinners and froze the extra, but I also wanted to try an exclusive freezer cooking day (before Violet’s arrival). I found four recipes with several overlapping ingredients for efficiency. The first three recipes are prepared with raw ingredients then frozen. To prepare, you put the bag in the fridge the night before to thaw a bit then dump it in the slow cooker for 6-8 hours (with my favorite slow cooker liners of course). The soup is fully cooked and just needs to be thawed/reheated. I did the potatoes and ham first because it was the easiest and didn’t have any “fresh” ingredients. 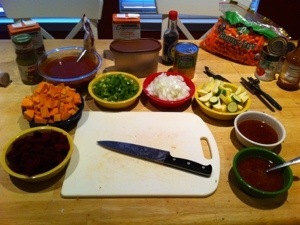 Then I chopped all the veggies and made the sauces. After assembling the veggies and sauces in the proper bags, I cut up 4 lbs of chicken breast and divided it between the recipes. Then everything was off to the freezer. From start the freezer, the prep and assemblage took me around three hours. Not too bad! 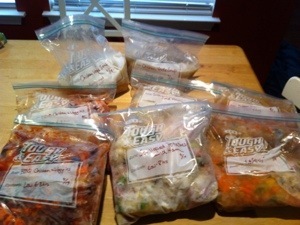 Here are the finished, frozen meals. That’s eight meals – four servings each so counting leftovers that’s really sixteen meals for us. I’m excited to taste the new recipes I tried. 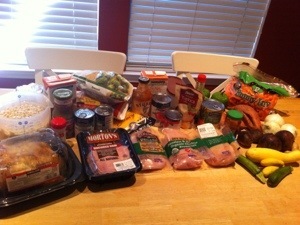 As much as I love cooking, I’m enjoying the extra rest time from not planning or preparing meals for a couple weeks. Today was a beautiful day that we will never forget: the day of your birth. In the weeks leading up to your birth, I met with your mom and dad to plan for your special day. They wanted your entrance to be as simple and as healthy as possible, and they planned to minimize interventions and medications to let things progress as naturally as possible. Even your older sister Hannah seemed protective of you; she and your parents carefully guarded the revealing of your name until your arrival. They were all so excited that you were coming! What a gift! Your mom made a special banner of paper rings to show Hannah how many days there might be til you would join them. As they tore one ring off each day, Hannah commented that it was starting to get very short. Early in the morning on Monday, October 8th, your mom awoke with some strong contractions. When she got up for the day at 6:30 am, they picked up fast and strong. I received a text from her around 7 am letting me know what was happening. I was surprised by how quickly it sounded like things were moving, so I called to touch base. Your mom was calm on the phone but had to stop to breathe with each contraction. By 9 am, it was clear that it was time to head into the hospital. When I got into my car to drive to meet your parents at North Austin Medical Center, the air was cool and crisp—a perfect early fall day. I could feel the anticipation of the day; a precious new person was coming to be with us. It felt like the most important thing happening on earth. I met your mom and dad in triage, and your mom was laboring hard. Your dad stood calmly on her right side, holding her hand. He was serene and steady, but you could tell he was also so excited. Your mom’s labor was moving fast indeed; she was already 6 out of 10 centimeters dilated and was feeling lots of pressure, which meant you were making your way down. 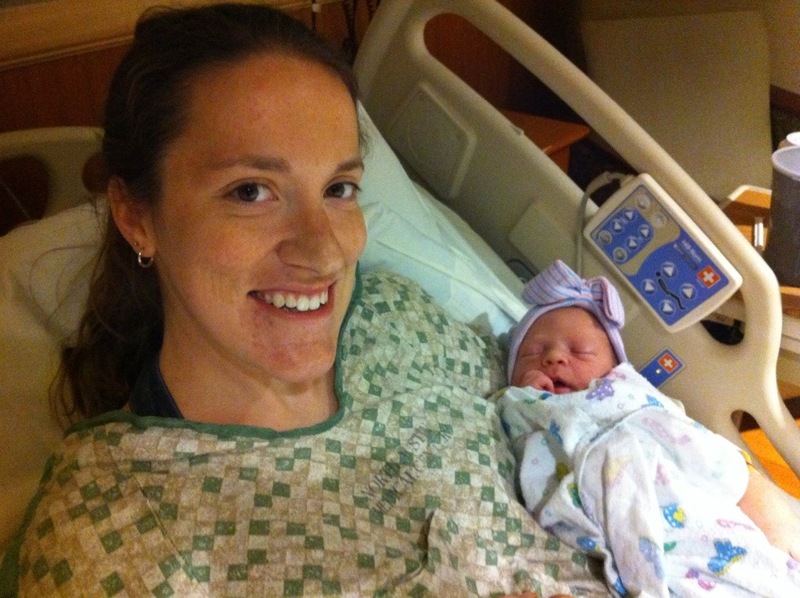 Even before we moved to the labor and delivery room, she was naturally beginning to bear down with each surge. Soon we were in L&D Room 14, and we had fortunately been placed with Nurse Lisa, who your parents knew from church. Over the next two hours, your mom labored with all her might, and your dad never left her side. He told her she was doing great and that she was in the home stretch; it was clear that he was truly proud of the hard work she was doing for their baby. Even though your mom was working harder than she ever had before, she never complained. She was focused and diligent, willing to make any sacrifice necessary for her baby. We were all in awe of her beauty and strength. By 12:20 pm, your mom was fully dilated and ready to push. Dr. Sebestyen joined us for the pushing stage and helped guide your mom through the next hour and twenty minutes of really intense effort. Around this time your mom asked your dad if they should share your name with us, so we could all call to you. Violet Elizabeth! What a beautiful name. We were so ready to soon see your face. Then, at 1:40 pm, with a mighty will, your mom bore you into the world. You were placed directly on your mom’s chest and held tightly in her arms. She greeted you with such joy—“Hi…hi! Remember me? Hi baby! I can’t believe you were in my tummy!” Looking at your dad—“I can’t believe she’s here!” Your dad, leaned in close admiring you, said sweetly, “Hi pretty girl. I love you.” Such precious moments to witness. You were beautiful, little Violet. So pink, so soft, and so content in the arms of your parents. You were just perfect. You weighed in at 8 pounds, 11 ounces, and you were 20 inches long. What a healthy girl! As you nursed eagerly, your mom talked to Hannah on the phone. Hannah asked, “Is she drinking the mommy milk? !” We all laughed. What sweet sisters you would surely be. Welcome to the world, dear Violet Elizabeth. We are so grateful to have you here with us; you are dearly loved. Today we say with joy in our hearts: Happy Birth Day! I’m pretty sure everyone who reads my blog already knows this, but for the sake of official-ness (and in case I have any surprise lurkers out there) – baby Violet is here! She was born on Monday the 8th, 8 lbs 11 oz. 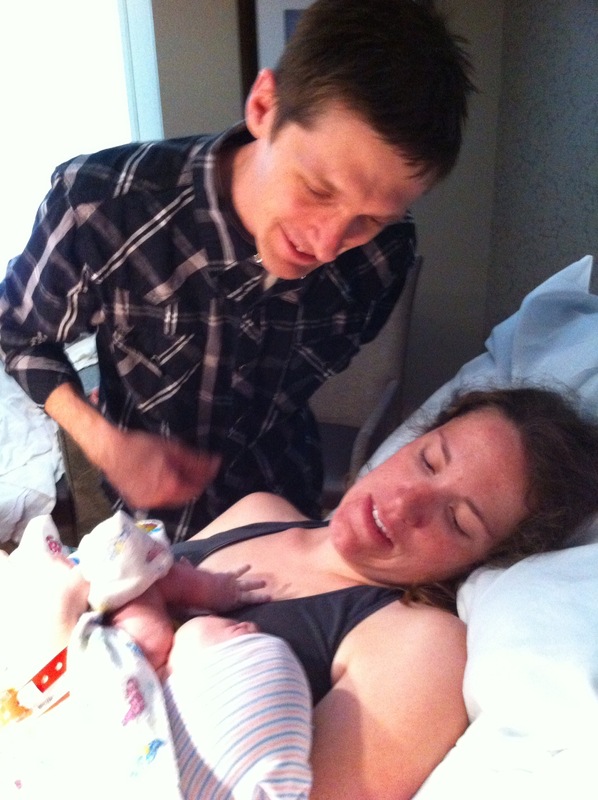 Our doula wrote an amazing birth story, and I hope to share it on here or do one of my own. In brief, until this point I have had absolutely zero physical accomplishments to my name. No trophies, no 5K’s, it’s just not my thing. But to say I gave birth to this amazing little person naturally, feeling and doing everything to bring her into the world… I feel pretty good about that. My mom went home after keeping the house running for eight days, and we are now finding our feet as a family of four. I’m ridiculously tired but made it to MOPS today! We are so thankful for our little blessing Violet. Life on Olive Street just got a little busier. Before Hannah was born, I wondered what it would feel like to be a mom. My previous roles were daughter, sister and wife. This was something different; my life would now be devoted, 24/7, to keeping this little person alive and helping her grow into the best big person she could be. It wasn’t in that instant, but one day I realized that over time I had not only fallen in love with this little person, I had feelings for her that were very different than other relationships. Now, as she is three, she regularly drives me to the end of my patience and takes me to the negative end of my emotional spectrum more than anyone else. But she also makes me laugh more than anyone else, and I have this passionate, crazy attachment to her despite the daily challenges. We spend hours and hours and hours a week together. Just the two of us. We have our routine, our friends, our jokes. I know some things will change with the new baby. Everyone will be making adjustments. I keep reminding myself that this sibling is a gift – I can’t imagine life without my sister! It’s hard to wrap my head around, but as God puts our family together, I’m trusting He’ll give me the same crazy love for each child as I have for Hannah. But I’m wondering how I could possibly love anyone else the way I love her? You’re my sweetie, my dear, my smile and giggle. You’re my playmate for always, my hug and my wiggle. eating ice cream sundaes or watching the TV. by you and beside you is what I really like. I can’t imagine life before you came along. You are the music to my dance and my song. the one I love forevermore. Undeniably. 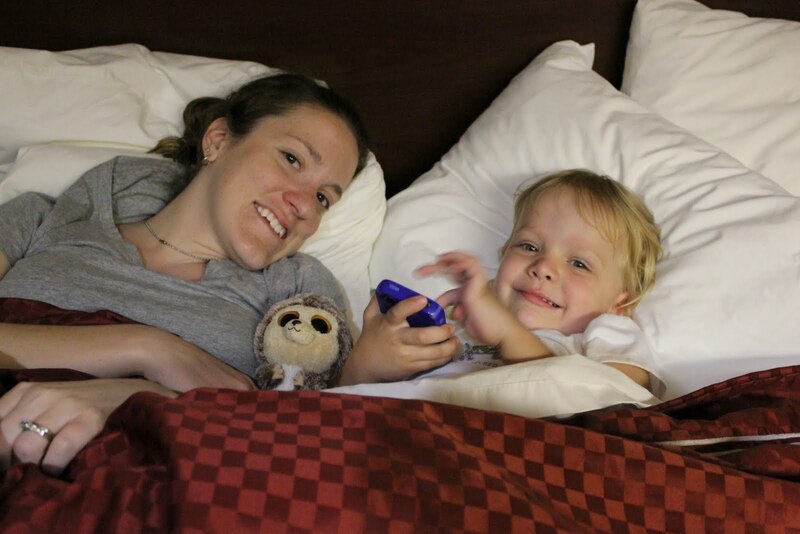 Did anyone else have an emotional rough patch going from one to two kids? Please reassure me!